The driver of a passenger train that derailed and killed seven people in Morocco last year has been convicted of manslaughter but released on time already served, his lawyer said Wednesday. The guilty verdict was handed down late on Tuesday by the court of first instance in the town of Sale near Rabat, the lawyer, Chaouki Ajana, told AFP. Larbi Rich was sentenced to five months and five days in prison for manslaughter, which amounted to the time he had already served in detention since being detained after the crash in mid-October, said Ajana. The train he was driving flew off the tracks about 20 kilometres (12 miles) north of Rabat in Sidi Bouknadel municipality on October 16, killing seven people and injuring 125. The 54-year-old driver, who himself suffered serious injuries in the accident, was arrested on October 23. He was due to be released later Wednesday, but his defence team would still appeal the sentence, said Ajana, describing his client as a "responsible man" with a flawless 30-year work record. "Larbi Rich is innocent and wants this to be recognised," said Mehdi Sabik, another defence lawyer. 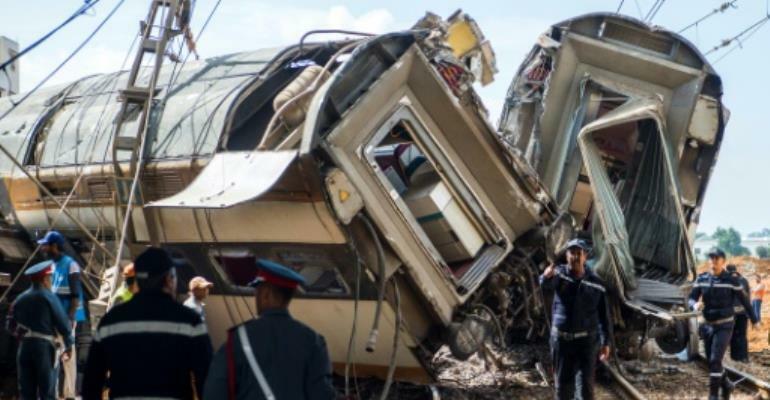 Prosecutors said in October that the derailment had been caused by the "excessive" speed of the train, which had been travelling at 158 kilometres per hour (98 miles per hour) instead of the 60 kph (37 mph) limit. The railway workers' union on Monday expressed its "unconditional support" for the driver and called on the national rail company ONCF to "assume its responsibilities". The court has yet to rule on compensation for injured passengers, with the next hearing scheduled for May 7, according to media reports.